Marriage record - (on file) - marriage after Banns -Joseph Barber abd Elizabeth Corless were married on July 2 1828 In Manchester Cathedral. Elizabeth Corless daughter of William Corless and Mary Glover, was born on May 7 1808 in Astley, Greater Manchester. Joseph occupation, shoemaker -- neither Joseph or Elizabeth had been previously married. Both the bride and groom were stated as "of this parish" Witnessed by Elizabeth Corliss & Alice Mc Inyre. Manchester Cathedral is a Medieval church located on Victoria Street in central Manchester. The cathedral's official name is The Cathedral and Collegiate Church of St Mary, St Denys and St George in Manchester. Although constructed over a period of 600 years, its main architectural style is Perpendicular Gothic, replete with tall windows and flat fan-vaulted ceilings. The interior of the church contains many pieces of period art, notably the medieval woodcarvings of the Ripon Carvers. 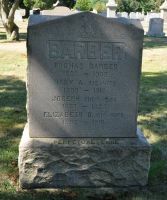 [S3922814029] FindAGrave.com, (Find A Grave, Inc.), https://findagrave.com/cgi-bin/fg.cgi?page=gr&GRid=103956352.